Bus Air Conditioner systems, Truck refrigeration units, Railway air conditioner systems and spare parts. We, SongZ Automobile Air conditioning Co., Ltd. is one of the best professional companies to develop and manufacture automobile air conditioners in China invested by HongKong Yee Fuk group, We have 6 manufacture plants with a total area above than 190,000 (47acres) square meters and more than 1400 employees. We held above 30% share of China bus & coach air conditioner market. We have sold above 32000 sets roof mounted bus air conditioners (cooling capacity bigger than 16Kw) in 2010. We have kept the lead position in China since 2002. We have supplied more 6000 air conditioner to Beijing public transport company for the use of 2008 Olympic Games. Today we are supplying to almost all of the bus plants in China. 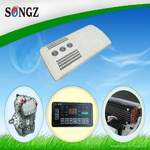 SONGZ is apecialised in the research and devaloping, manufacturing and marketing of bus air conditioner systems, truck refrigerators, railway air conditioners and spare parts for more than 15 years. SONGZ started to sell bus air con in 2000. Now SONGZ annual sales volume is No.1 in global range and it has maintained No. 1 in sales for a consecutive 10 years with market share up to 30% in China. SONGZ products have been sold for more than 35 countries and win global customers satisfaction. We are now looking for partners from all over the world. And we want to make contact with bus body builders, and bus air conditioenr systems dealers from the global.